Do you want to become a research associate? Become a member? Do you want to become a research associate? Mars Analogue Research, Astrobiology, Stratosphere Balloons and manned spaceflights are all topics covered by the Autrian Space Forum. For most projects, the Forum partners with main players like NASA or ESA, from European Research Facilities to University Institutions. Especially field missions, which generates extraordinary international cooperation. 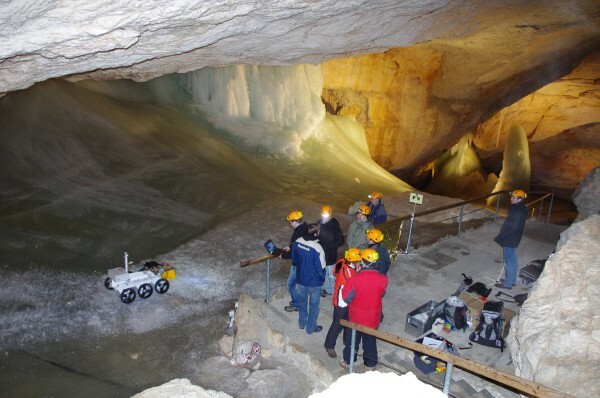 The polish MAGMA rover carrying the french WISDOM ground penetrating radar (scheduled for the ESA EXOMARS mission) during an OeWF field test in the Dachstein ice caves. What is an OeWF Research Associate? Research associates are young professionals, who want to pursue a project related to the research and development activities of the Austrian Space Forum. It is an opportunity to obtain “real-life” project experience in the field of space exploration, mostly analog research and start building up a professional network which may last a lifetime. Often, they result in peer-reviewed publications in major space exploration journals. The position as researchers at he the OeWF is unpaid and typically last between 2-12 weeks. We recommend applying for a position no later than 6 months in advance. We are hosting students, guest researchers, volunteers and people with a passion for space from various professional backgrounds and from many nations. Typically, these stays last from anything between 2 weeks to half a year and are generally unpaid. Due to the number of applications each year and the limited number of slots available, there is a competitive process in place to select the best applicants.